I love beautiful things. And sometimes these beautiful things include wanting a mini bar. I love being at home and I love decorating, updating and moving all the furniture in my house pretty frequently. One thing that’s been on my list to acquire is a bar cart. Or a mini bar area. But so many of these carts are just not quite right, expensive or both expensive and vintage. I think I found the perfect base. This tray table, spray painted some awesome color would be the perfect mini bar cart. Am I right? And it’s only $50! Win-Win! All you would need is a can of spray paint, some gloves, a well ventilated space and bam! Super awesome mini bar. We could also include a heavy dose of sparkle, but let’s not make this too complicated. I love CB2…they have so many unique fresh items. 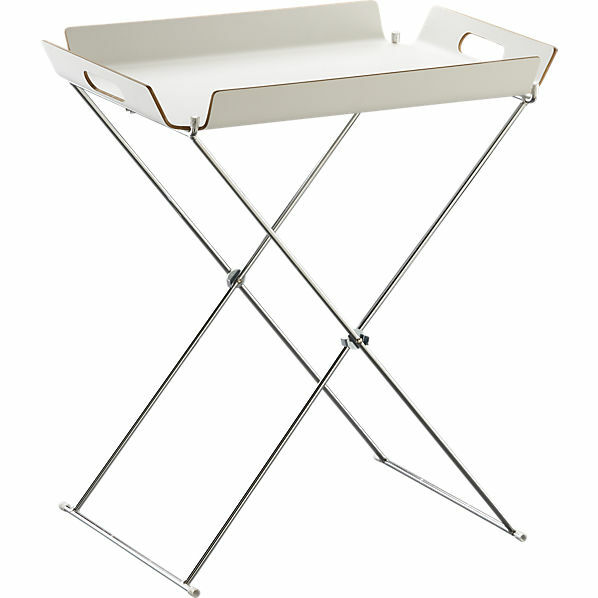 Great looking tray…I kinda like the chartreuse one too.